Participate actively as informed and responsible citizens in social, cultural, global and environmental matters. Competence in basic technology skills is an essential component of life. 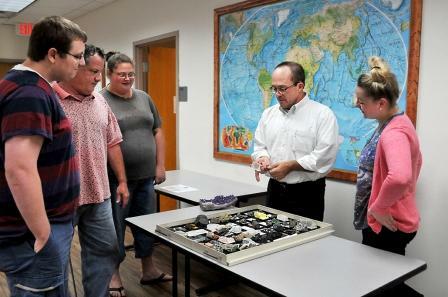 Accordingly, NWF State College has incorporated technology throughout its programs and courses. Each two-year degree program contains at least one course that requires the student to demonstrate fundamental technology skills. All ENC 1101 - English Composition I classes are taught in a computer classroom, and students are required to complete assignments and other activities on a computer. CGS 1100 - Microcomputer Applications is a requirement or prerequisite course in many A.S. degrees. In support of the technology requirement, NWF State College offers student access to and technical support in open computer labs at all college sites. B.A.S., B.S., A.A. and A.S. degree-seeking students will meet the computer technology skill requirement through completion of ENC 1101 and/or CGS 1100 and may encounter more advanced computer skills in other elective, technical or general education courses. See the course descriptions section of this catalog for the courses designated as part of the Technology-Across-the-Curriculum program. All associate degree students must complete at least one three-credit writing class as part of their general education program. Additional writing activities are required in all general education humanities courses. Bachelor of Applied Science, Bachelor of Science and Associate in Arts students must complete twelve (12) to fifteen (15) college credits from designated general education Gordon Rule Communication, Humanities and Social Science subject areas. See the A.A. General Education section of catalog for specific courses. Oral communication is an integral part of the NWF State College general education program; thus several general education courses include graded activities designed to build speaking and communication skills. All B.A.S., B.S., A.A., and A.S. degree-seekers must satisfy the Speaking-Across-the-Curriculum requirement and may do so by completing at least one of the general education courses designated as part of the Speaking-Across-the-Curriculum component of the General Education program. Students who successfully complete other speech, forensics, or oral interpretation courses may request that such courses be used to satisfy this requirement. See the A.A. General Education section of catalog for specific courses. Florida’s Gordon Rule (FAC Rule 6A-10.030) includes a legislative mandate that all baccalaureate and Associate in Arts graduates successfully complete specific math and writing requirements. B.A.S., B.S. and A.A. graduates must have successfully completed at least 21 college credits from designated general education Gordon Rule Communication, Humanities, Social Science and Mathematics subject areas. A.S graduates must have successfully completed at least 9-12 college credits from designated general education Gordon Rule Communication, Humanities, Social Science and Mathematics subject areas (SATC Humanities may be replaced with General Humanities in the AS degree as long as Speaking-Across-the-Curriculum is met elsewhere. General Social Science may replace Gordon Rule Social Science, thus lowering the Gordon Rule requirement for the AS degree from 12 to 9 college credits). All B.A.S., B.S., A.A., A.A.S, and A.S. degree-seekers must also earn a grade of “C” or higher in each Gordon Rule course used to satisfy general education requirements, whether the credits are earned at NWFSC or elsewhere. Students who plan to enter any of the Teacher Education programs leading to certification must complete 6 credit hours of coursework with an international or diversity focus. Any course identified as meeting NWF State College’s Diversity Requirement will fulfill this requirement, including foreign language courses. On May 16, 2018, the State Board of Education approved Rule 6A-10.02413, Florida Administrative Code (F.A.C. ), Civic Literacy Competency, as required by section 1007.25(4), Florida Statutes (F.S.). The rule became effective on June 19, 2018. All first-time-in college associate in arts degree seeking students beginning in the 2018-19 academic year must demonstrate civic literacy competency prior to graduation either through successful completion of a course or by achieving a passing score on an assessment.